It�s not boasting to state plainly that you were right if you are equally direct about your errors. I have until now rightly predicted all of the stock market�s major downturns, starting with the one in 2007 that gave us the Great Recession. The first of those led to the writing of this blog. The next two were predicted and recorded as they happened on this blog, and the latest, whether it proves right or wrong, waits shortly in the future. Each time I made such a prediction here, I bet my blog on it. The blog is still here, but will it continue to be? I am using the term �crash� loosely in this article because one time I clearly stated the impending plunge would not technically amount to a crash (a sudden drop of more than 20%) but it would be much more significant than just a correction (a decline of 10%) because of how drastically it would change the nature of the market. I�ll show here how it did. The next time, I predicted a �crash� that did not quite turn out as significant as I claimed it would be, but it was an historic event in that the Dow fell further in January than it had ever done in its entire history, and it did so exactly the timing (to the day) that I laid out in advance. This [prediction] is coming from someone who has not been crying the sky is falling for some time�.. I won�t go as far as I did with the housing market [back in �07] by predicting a stock-market crash based on the evidence at the moment, but I will say it is looking like a significant risk this fall, should other events trigger panic in stock investors who know they are heavily leveraged and who know everyone else is, too. Every force mentioned in my March forecast has built up in the directions predicted, bringing the risk level for this fall to exactly the precarious level I predicted. Remember, I bet my blog on things taking that direction this past March, promising I�d stop making forecasts if I was wrong about the direction these headwinds were taking us�. 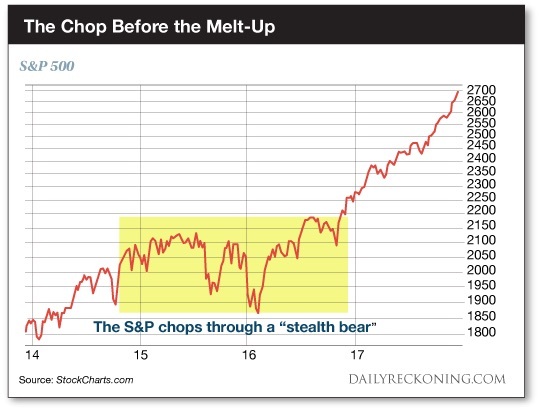 I wrote and published the article two weeks before the big dip that took us into the yellow box in the graph above � a time which the author who published this graph now refers to as �a stealth bear market.� I would later write that, as far as I was concerned, the events that happened that fall broke the spine of the bull market completely (the Trump rally that ended the period in the yellow box being an entirely new phenomenon built on a different basis of speculation). As with the author who published the graph, I disagree with those who say this has all been one long bull market of recovery. I think I was right about that fall with the perspective one gets when looking back from a distance. If you took all your money out of the stock market at the start of that yellow box, you could have kept it out of the market for almost two years, and you would have missed nothing but a bumpy ride to nowhere. The bull clearly broke its back with that first big plunge in the fall of 2014, never to recover without massive intrusion by a new force in the market. Technically, the S&P fell 19% by the time that break finished playing out, so it missed becoming an officially declared bear market by a mere nick; but I think it is clear the market broke � like a hurricane that misses being named a hurricane by just one mile per hour. It�s a naming technicality that doesn�t change how bad the storm was. At any rate, I had been smart enough to stop myself short of saying the market would �crash� or that total calamity would hit the economy and had predicted, instead, that a market downturn of major significance was about to happen. Clearly it did, so I got to keep writing my blog. Note that the massive change this event brought to the market was ONLY reversed by the momentous election of Donald Trump and the ensuing Trump Rally. You can see the exact point that happened near the end of the yellow zone above. Without that event, the market would still be churning sideways; but I never said the change I was predicting in 2014 would be apocalyptic or that the market would stay down forever. As noted then, I also had not predicted anything dire for quite some time prior to that. (I�m not a permabear, always predicting doom and gloom until it happens.) It took a new major historic event to upset the country and extract us out of that seemingly endless sideways bounce and crawl of the �stealth bear� that had begun right when I said the market would break. Let me share something counter-intuitive. Whether the Fed raises interest rates or not, this Wednesday is D-day for the Fed�s economic recovery because the Fed is Damned if it does and Damned if it doesn�t. I�ll certainly show you why, but the counterintuitive part is that you can expect the market to crash upward as it leaves Wonderland and returns to reality. Fear of the Fed�s first rate increase is already priced in as the expectation for Wednesday�s Fed meeting. If the Fed raises rates, I would expect a momentary pause � a gasp of uncertainty � as investors quickly look around to see if the sky falls. Then when it doesn�t fall, they will breath a huge sigh of relief and take that as proof that the contrarians or bears were wrong. In sudden euphoric lightness of being they�ll proclaim, �We�re all right! We made it! We survived the day we have been told to fear, and the sky didn�t fall.� Worry will give way easily to euphoria, which wants to happen. The feeling of nothing can stop us now will take the day. The Fed�s plan worked; things didn�t fall apart as the prophets of doom and gloom said. We are well on our way! But what do you know about euphoria and human beings? In my experience, euphoria is more often divorced from reality than based upon it. It skews perception of reality, and usually comes in a manic-depressive wave. First you are washed over by the crest of euphoria and then you are sucked down into the trough of despair�. The economy doesn�t crash because the Fed ends its free interest. The economy is already sinking. What crashes is the illusion of recovery. December 16, 2015, is D-day because it�s the day when reality starts to sink in�. And what happened? You have to look no further than the yellow box in the graph above. I made my prediction in the period between the two deep plunges inside the yellow box. The market nudged up on December 15th right after the Fed�s announced its increase, then it shot up a lot more on the 16th; but then it stumbled and fell on the 17th � 19th. The bulls tried to rally one last time, then walked off a cliff in January in what became the biggest January plunge in market history. But here is the part where I have to also say where I was wrong. While I was right to the day about the timing and about how the ups and downs would play out, I was greatly wrong in stating that it would lead into an economic calamity I called �the Epocalypse.� It did not. I kept writing my blog, however, because most of it had happened exactly as I said it would, though not to the degree that I had predicted. It was more of an overstated hit than a miss. Unlike the first bet where I resisted the doom and gloom, this time I had gone too far into the glooming. Still, it was a record plunge that January, and it did become the lowest point in the period designated above as the �stealth bear market.� It was a lot closer than anyone else�s call had been. My final time in betting my blog (because I choose to put my money where my mouth is) was this year when I bet the economy would show serious signs of breaking down by summer and stated where the cracks would begin to show. In addition to laying out the exact fault lines that would show up in the summer, I predicted the stock market would crash in the fall or more likely in January of 2018, but no later than that. Now it�s time for me to say, �Let�s watch what happens.� Things clearly aren�t looking good for me this time around, but hang around long enough to see how it plays out. But first, about those major cracks that I said would show up in the summer. Three of the major cracks that I said were likely to emerge were the retail apocalypse, the beginning of a slow decline in the housing market and a crash in the auto market. All of those things became evident last summer, just when I said they would. Then, however, the hurricanes and wildfires hit. I noted the severity and spread of that destruction would probably turn the housing market and the auto market around for the next year or two. Obviously, I cannot see hurricanes coming as rescue wagons that will thwart my predictions, but such is the risk of making economic predictions. There can be unexpected white swans, just as there can be black ones. I�m not suggesting those catastrophes are ultimately good for the nation in the long run; but just like a wartime economy, they can light the economy on fire by forcing all kinds of spending. Thus, they greatly accelerate the velocity of money as much as they accelerate the velocity of air. I pointed out before any statistics came in that these would would postpone the events I had predicted and that had already begun to show. So, I didn�t wait to alter that prediction until after the fact. Simply put, you cannot wipe out or badly damage nearly a million houses and nearly a million automobiles without all of those having to be replaced as quickly as possible. As most were likely insured, so most would be replaced in the fall and winter and on into the spring of 2018. In fact, rebuilding so many houses will take a couple of years. Some people would rebuild homes once the cleanup was over; as many as possible would soak up surviving houses that were already on the market (driving up the price of those limited available homes) because they needed something to live in right away. The supply of existing homes in those areas, however, would be very limited; so many people would have no choice but to relocate to other regions in order to find immediate housing. The hurricanes would create a lot of demand for both new and old homes and would fill up a lot of vacant apartments but would also press people into other states to find housing. It�s hard, maybe impossible, to quantify how much of the housing resurgence throughout the US is due to the hurricanes as well as to the wildfires that have been destroying homes in California since last summer, but such vast swaths of destruction clearly has to have a major impact on the housing market when you are talking a sudden need for a million replacement homes and a million replacement cars. That will certainly drive up the prices for both new and used homes and cars. So, those industries, which did start to reveal signs of decline in the summer have been greatly shored up on the backs of insurance companies and US debt in the form of relief � for now. Nevertheless, a bet�s a bet. Events that were often described by the media as apocalyptic in scale swept in out of the blue and shook the whole economy by creating a need for all kinds of replacement goods beyond just houses and cars. They stirred the pot rapidly and turned up the heat by adding fire and air, forcing the velocity of money to heat up everywhere. However, a major part of my bet was also that the stock market would crash in the late fall or January of 2018. If that turns out as predicted, I will claim I had a lot more significant hits than misses, given that the misses have reasonable justification, too. In which case, I�ll stay in the blog-writing business. If the market doesn�t crash, however, then then the balance tips in favor of the misses, and I�m out. Of course, my market predictions look unlikely. Something else I did not see with any clarity (but then neither did anyone else) was that the Trump rally in the stock market would last so long or climb so breathlessly high. But here it is. The anticipatory phase of the rally is all in. That�s why we have a noticeable lull now that the Trump tax cuts have been approved at a time when we might normally expect a Santa-Clause rally. There is no more pricing in happening. Those new tax breaks will start to come in just a few days from now, and I anticipate the market will fall when those breaks become the law under which people are selling stocks. If I could revise my bet, I�d be tempted to say that fall will no longer end the rally, but the first month�s transition from anticipating to experiencing life under the new laws will likely be rough. There is probably a lot of sea to move through this passage. I cannot revise my bet, of course; but I�m just saying the unforeseen strength of the Trump rally would cause me to take some of the direness out of the fall that I anticipated if I could. The market experienced enormous overheating (like no one has ever seen before) during the long Trump Rally, which lasted much longer than I predicted it would (but, then again, much longer and higher than even the most optimistic bulls predicted). Trump�s tax changes will definitely stimulate the market in the year ahead; but Januaries are slump months more often than boom months, and there is good reason to think investors are ready to catch their breath and secure some profits out of the market after that long, exhilarating ride � a ride that at the time was entirely speculative because it was based on tax cuts that no one could be sure would happen. Some profit taking at the end of a year with a rampage like this would make sense. Postponing that profit taking until it can happen under much better tax rules makes even more sense � to me � in a world that increasingly makes little sense because of how rigged markets have become due to central-bank manipulation. So, I expect January to be a month of profit-taking, but will that event become bearish enough to save my blog, given that I predicted a stock market crash that would most likely happen in January? You can read more of my predictions on that matter in my next post, which will contain my 2018 predictions, but which may also be my last post. Time will tell (and it won�t take much time).